Bali is undoubtedly among Southeast Asia’s mostappealing destinations, proven in the numbers of tourists visiting this paradise island every year. Sadly,some dishonest people take advantage of that, makingit unavoidable for travelersto stay away from tourist scamsin Bali, as well as atany other popular destinations in the world. But, don’t let this keep you fromvisiting this wonderful island and having a good time here. With somefollowing tips,hopefully,you will find yourself better prepared and be ready for your trip to Bali. Arriving at Bali airport afterhours of flying, you are likely to find yourself completely tired and exhausted. That is not to mention another hour or two of waiting in line to purchase your Visa and clear immigration. At that moment, all you want is to get to the hotel really quickly to drop the baggage and freshen up. That’s when some guys would suddenly show up and ‘help’ you, pulling your bags off the carousal and strapping them on their back or over their head.At first, this might seem like a nice Balinese hospital gesture. But as soon as he putsyour stuff in the taxi and looks at you with his puppy eyes, you willcome to realize that all these ‘hospital gestures’ are just ways for ‘some guys’ to get your tips. Tips:To avoid this scam, quickly find your baggageafter clearing immigration. In case someonehasalready pulled it off the carousal for you, thank them and insist on carrying it yourself. Taking a taxi in Bali might seem cheap, but it can end up cost you ‘a fortune’ due to the lack of taximeters, longer route, extra charge or no change. Tips: Choose a cab with a taximeter if possible and request it to be turned on. Otherwise, make sure you agree on a fixed price before getting in one and prepare small notes to pay in advance. According to some tourists’ experience, Bluebird is one of the most reliable taxi companies in Indonesia. They always follow the meter and do not impose any additional charges.Even so, if you’re travelling a long distance, such as from Kuta to Ubud, don’t forget to ask the driver the price beforehand and check whether there are any surcharges. Money changingis a big business in Bali, visibly in the number of money changers available here. You caneasily find theirwhiteboardsblocking the narrow sidewalks almost everywhere, indicating very high ratesof exchange to attract innocent tourists. Firstly, they will pretend to be trustworthy by using a calculator to count the actual amount of rupiahs according to the exchange rate. However, you still need to be careful and use your own calculator in case they use a fixed one. Then, they will claim that they do not have any bigger notes than $10,000 Rupiah, and skillfully drop a few ones before handing a big pile of notes to you. Now, imagine yourself counting a stack of a few hundred $10,000 rupiah notes! Tips:Come toauthorized money changers in Bali.The exchange rate there may be lower but they are definitely more reliable. And, as a rule of thumb, always count the money whenever you receive it! Renting a scooter is a great way to discover the islandof Bali. 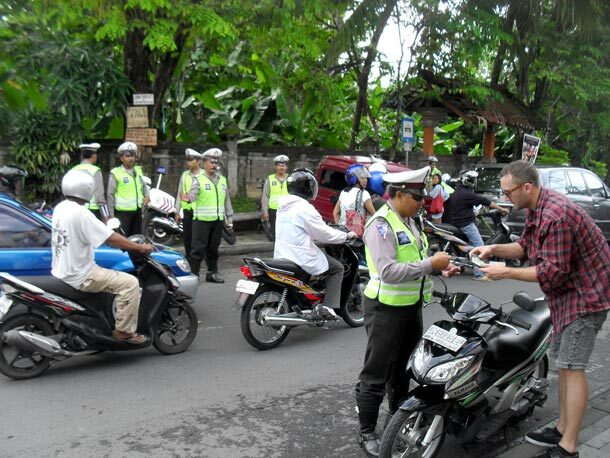 Balinese police are notorious for pulling foreigners over even whenyou’re doing everything right. Then,they will instantly come up with a reason to give you a “ticket”, and tell you that the “fine” is higher when paid at the police station. Therefore, you will have to pay the police on the spot. Tips:Always wear a helmet when riding a motorbike in Bali, stick to the traffic rules and bring along your International Driving License. Also carry some small notes in your pocket in case you have to pay for the fine. It is advised that you pay no more than IDR 100,000, and smile even if you feel upseton the inside, coz it will surely make the negotiation easier. So, be careful. And good luck!